Mumbai, India's financial capital is in a pitiful state every year during the monsoons.Roads get flooded, house leaks are rampant and rains practically disrupt travel within Mumbai. A month ago, the BMC ( Mumbai’s local municipal body) had assured the masses, that this year, there will be no waterlogging on the streets due to the annual rains. They had claimed to have arranged for an efficient drainage system which was ‘monsoon-ready’ ! With a budget of Rs9,865crores (or more than US$ 2billion), the BMC is the richest civic body in India. Understandably so, considering its mandate is to keep Mumbai running. 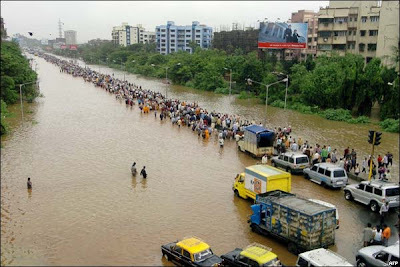 But year after year, inspite of BMC's assurances, Mumbai drowns during Monsoons. I have attempted to research the reasons for their failure. For close to two decades, the BMC has been run by the Shiv Sena-Bhartiya Janata Party combine. However, with the Congress-Nationalist Congress Party Combine winning the State Elections in 2004, power over the city had been split. With opposing parties running Mumbai’s largest and most important organizations, there have always been spats, face-offs and blame games between both organizations, and hence political parties, for all the ills plaguing this city. Crater filled roads ? Blame the MMRDA for digging up all the roads for the Mumbai Urban Transport Project (MUTP). Choked up drains ? Blame the BMC for not clearing the pipes before the monsoons. And so on and so forth the blame games between both organisations have continued for some time. A major link between the eastern and western part of a suburb have been flooded with storm water. The BMC makes pre-monsoon arrangements like desilting of nullahs close to subways but the proximity of stables owned by former corporators has left BMC with no option but to neglect them. The Indian Railways and the BMC spend millions of rupees on the eve of the monsoon, hoping to clear up the debris that has been piling up over the past 12 months.But a nexus between shady contractors and corrupt officials results in the efforts being washed up in the very first rains. People in Mumbai are used to throwing garbage on the streets, drainage and sometimes even from their houses. Much of this garbage finds itself in the drainage pipes and chokes them. We see the result of choked pipes during the monsoons. The growing Mumbai population does not make it easy for BMC to execute its planned tasks. Given the issues above BMC cannot be soley blamed for Mumbai's woos. The state government , political parties and the people of Mumbai are all to be partly blamed for this mess.